Welcome back. You've been missed. I hope that things are better in your world and the e-short looks exciting. Welcome back! I'm looking forward to checking out A Royal Birthday, and to seeing you blogging a bit more again, perhaps! Thank you! And yes, there are *things* in the works. . . .which is all I can say for now. I read False Princess in one day, I literally could not put it down! 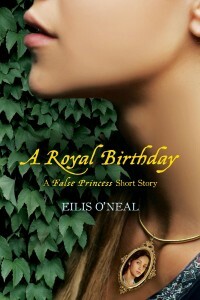 I can't wait to read A Royal Birthday (and I hope much much more in the future). <3 Thank you so much! What a wonderful Christmas present for all your fans!!!! The False Princess book was absolutely enchanting. I am so looking forward to reading this new book and all your future work. All my best to you!! I'm a huge fan of The False Princess, and I'm excited to read the short story - what a lovely idea for a pre-quel! Keep writing for all your fans! I love your book and am really looking forward to your next one:) best of luck with all your writing. I just bought this short story and am so excited! I love The False Princess, but my daughter is obsessed with it. Thanks for giving us more from this world!